Recently, I happened onto the artwork of Mark Cottman. Cycling isn't his only subject, but he connects incredibly well with the spirit and inside sense of cycling. Cottman's art has been featured on magazine covers like The New Yorker. If you like cycling and appreciate art, you'll like how he expresses what he sees in it. This image is titled "The Road Less Traveled." Has a stained-glass reverence about it, don't you think? You can view his website and browse an online gallery at http://www.cottmangallery.com/. Thanks for your post about my work. 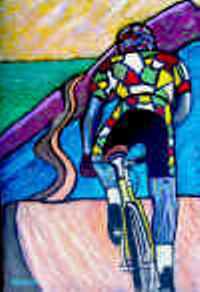 Here is a link to the Mark Cottman Gallery's latest exhibit, Bicycle: The Art of Cycling.